This new Lightweight Ramp is Drive Medical's newest design of ramps for wheelchairs or scooters to traverse from one surface height to another. 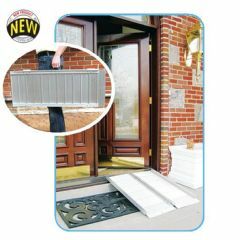 Features include perforated slots in the deck to keep water from collecting on ramp and a convenient carrying handle. A variety of 2 to 6 foot lengths meet elevation challenges. Ramp weight capacity is 600 lbs and comes with a limited life time warranty. A travel bag is included to help keep the ramp clean and protect other vehicle contents. Easy to take with you.. Safe. During recent remodeling of my home, I did not have access to my installed ramp. This allowed me to use another entrance to my home without having to install another permanent ramp. This saved me money plus I now have a ramp which is small enough to keep in my vehicle for unexpected obstacles. I have bought a t least 4 ramps from you, this on gets him up one step.